The best kind of shopping is the one you can do from the comfort of your home. 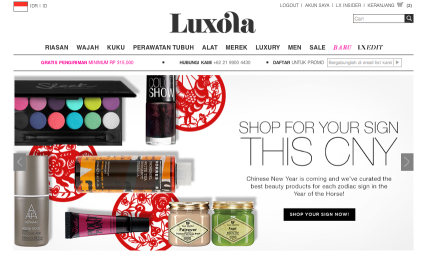 We’re sharing our experience getting beauty fix from the hottest makeup and skincare webstore in town, Luxola. Luxola was founded in 2011. After spending a few years working in Southeast Asia Alexis Horowitz-Burdick discovered a lack of reliable and efficient e-commerce platforms offering a vast range beauty products within the region, and decided to step up to the task. Achieving the overwhelming support of both consumers and investors, Luxola has very quickly grown into becoming the #1 destination for beauty in Southeast Asia, serving customers in Singapore, Malaysia, Thailand, Indonesia, Australia, India, Philippines, Hong Kong, Brunei, and the United Arab Emirates. The selection isn’t huge, but they have beauty brands from Europe and America that are virtually impossible to find in Australian beauty stores, including Sigma, Zoeva, Beauty Blender, Deborah Lippman, Tweezerman, Tangle Teaser, as well as some drugstore brands like Maybelline and L’Oreal. And another plus – all their products are 100% genuine, meaning no fakes will be coming your way! To put it simply, their prices aren’t outrageous. You can shop on websites like Ebay and Amazon to get a better deal, but even then you can’t guarantee whether you are actually buying a genuine product. Aside from the perils of buying online, Luxola has pretty reasonably priced genuine beauty products, and they have sales ranging from 20-30% off, every single day! Plus, you get 20% off your first order just for signing up to their email service (which is basically just in place to tell you when sales are!) And plus, when I received my order, I found a $20 gift card in my package. Definitely a plus in my book! Found a 30% discount code and literally shopped for an hour on Luxola! Love the brand selection, and the discount definitely made the prices very attractive. Delivery guy also texted before reaching my place to check if someone was home. All around prompt and reliable service! I ordered the Alima Pure bronzer in Trinidad – perfect shade and love the texture. The check-out process was simple and delivery was free. I love how you can choose your delivery time, and then they even send you a text when they’re on the way! You also get to choose 2 sample items for free…who doesn’t love free samples?! All around excellent shopping experience! What I love about Luxola, is that it’s focused on bringing in brands you’ve never had access to in the region. You’re always in a mode of discovery, but at the same time, you can pick up old favorites alongside these new ones. I often replenish and pick up a couple of new things along the way. My favorite thing too is how easy it is to communicate with your delivery driver. You never have issues since its’ so real time and personalized. I wasn’t home and he was very accomodating and dropped my package at the door. In the end, there’s nothing stoping you now from getting beauty goodies from Luxola. It’s easy and safe. Most importantly, you deserve a few nice things to pamper yourself!